A favorite at Renaissance Faires and Oktoberfests, this three-piece outfit enhances the maiden in you. 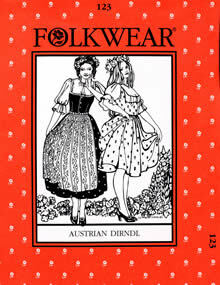 Variations include knee or low-calf length, high or low-neck dirndl bodice, high or low-neck blouse, and an apron. Pattern features many options for detailing, ruffling, ruching, and shaping. 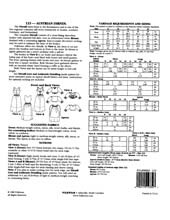 Information included about authentic detailing, custom-fitting, and adapting garment for Renaissance costumes. Misses 8-16.